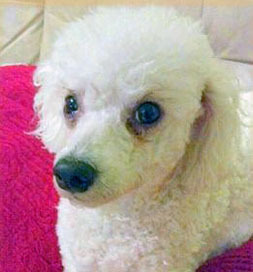 The little, unkempt Poodle was running along a highway when she was whisked to safety by a good Samaritan, who took her to Santa Rosa County Animal Services in Milton, FL. She had no collar, no tags, no microchip, so where she came from was a mystery. They shaved all the mats from her coat and painted her toenails. Now she looked like a princess, so that’s what they named her. No one stepped forward to claim her, so she went up for adoption. Flower has found a good home. Meanwhile, the McCartys, who live in Pensacola, FL, wanted a friend for their Papillon, Jubilee, whom they had adopted four months earlier, and so Melissa McCarty began searching on Petfinder. She saw the listing for Princess, estimated to be about 5 years old, and thought she looked just right. It has turned out to be perfect. Princess, whom they renamed Flower, and Jubilee have become best friends. “They love playing ball, wrestling, and running in circles like they are crazy through the house,” Melissa says. All that play leaves them exhausted, so they curl up together for a nap. When the McCartys are away from the house, they can count on seeing two little faces watching for them at the window upon their return. It’s a wonderful homecoming. Of course, the joy is not one-sided; it’s a mutual admiration society. Flower and Jubilee are much loved.